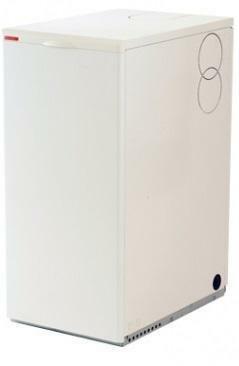 The Kabin-Pak HE K150HE Regular Oil Boiler is a highly reliable unit that’s been designed and manufactured by Warmflow. This boiler is a highly efficient unit and features a 93% efficiency rating. It’s available with a high output rating of 44kW which makes the unit perfectly suitable for larger homes with higher demands for heating and hot water. If this output is too high for your home, the boiler is also available with a range of other outputs from 15-44kW. This condensing, floor-standing boiler comes in an IP45 rated grey casing that houses many features and benefits. It’s available pre-wired or pre-pumped, comes with a pre-wired factory fitted burner as standard, a thermostat, circulating pump, a Riello RDB2.2 and 3.2 burners and has one IE320 mains socket supplied which needs to be wired on site. They also come with a factory fitted 3-bar pressure relief valve, auto air vent with the multi-optional low level flue that can be positioned to exhaust from the back, left or right-hand side of the casing, front servicing and it’s suitable for use with conventional flues or with the multi-optional HE easy-fit balanced flue system. An optional frost protection thermostat kit is also available that protects your boiler all year round, especially through the cold wintry months when the unit is needed most. As this is a Regular boiler, also known as a Heat Only or Conventional boiler, it heats your central heating system directly and produces hot water for your cylinder. Due to the fact that you need a hot water cylinder, which is often fed by a cold water storage cistern located in the attic, this boiler isn’t suitable for smaller properties or homes where space is limited. Available with a 5 year warranty, you can install this boiler knowing that you’re well covered.